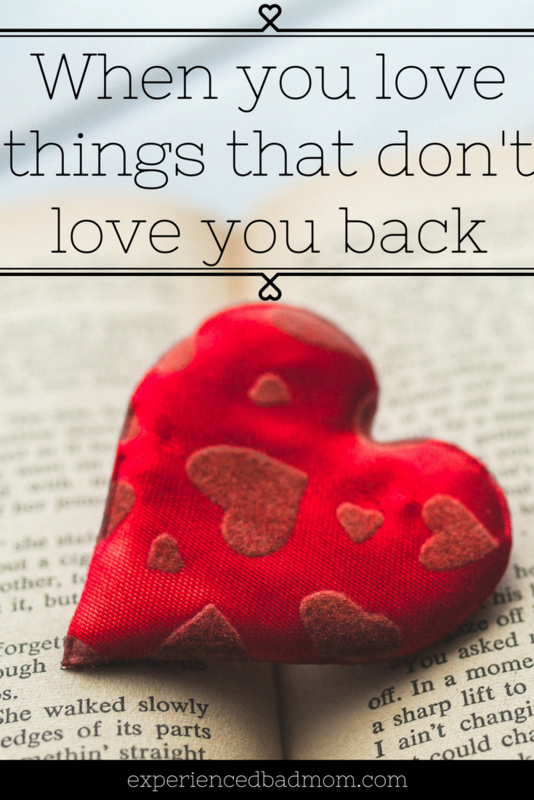 “Don’t love things that can’t love you back,” a wise man once said. Actually, it was a guy who installed a closet in my house. Nonetheless, his advice is solid. Yet, there are inanimate objects I love that don’t–and won’t–love me back. Things like a floral top I found in my closet recently. I bought it in 2007 when I was shopping for clothes to wear when I returned to work after having my daughter. The top, made out of cheap polyester, was cute and made me feel good about myself. I can’t get rid of it because when I look at it, I remember not only how it made me feel, but that special time in my life when I had my infant daughter. It made me think about other things I love that can’t love me back. I had a 3+ year battle with a lemon car that, for legal reasons, I am not allowed to discuss. Sigh. But after that struggle I landed my latest car which I love. Having a car that doesn’t work makes you really love a car that does work. Darn Elefun. Every time I try and put the game Elefun in the charity pile, I see my son’s face as a toddler. Gleeful, reaching to the ceiling, trying to catch those plastic butterflies that took 5 minutes to shove back in the Elefun trunk and less than 30 seconds to shoot towards the sky. My daughter is a writer-in-training, I’m happy to report. She writes the best cards, like this one from Mother’s Day last year. I treasure her writings. I also have a big box of letters from my husband, written when we were dating and going to separate colleges. This was just before the dawn of e-mail, but I’m glad to be so old to have physical remembrances of that time. Seems silly, no? But I love my pair of scissors. They are substantial and cut beautifully. They sat on my mom’s desk for years and somehow she let me have them when I left the nest. They were a bridal shower gift to my mom back the ’60s. How cool is that? I could go on with more things I love that don’t love me back, but that might get weird. So tell me: do you love things that won’t love yo back? What are they and why do they mean something to you? I, too, keep hand-written cards. I have a cedar chest full of cards, awards, accomplishments, newspaper clippings, etc. in relation to my life. Once in a while I’ll go through it and go down memory lane. Yes! I’m jealous that you have a cedar chest in which to store your treasures. That would be ideal for archival purposes–plus I bet it smells really good. Ooo, excellent point Chris. I’m glad you have some objects with lots of meaning, too. Oh my gosh we no longer have Elefun! How have I allowed the 4 year old to never play it? That is what happens to the 4th child, right?! I am still laughing over your first two lines of this post. Those closet installers know a thing or two about life, I tell you! He was so wise! And the closets turned out great, too.